Lingual crests of cheek teeth show some wear and cusps are starting to become blunt. Dentine now thicker than enamel on cusp of fourth cheek tooth (first molar). Dentine of fifth cheek tooth (second molar) usually not as wide as enamel. Last cusp of sixth cheek tooth is flattened. Lingual crest of fourth cheek tooth (first molar) is gone. 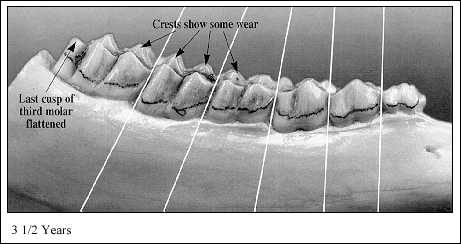 Crest of cusps on fifth and sixth cheek teeth (second and third molar) are blunt. Dentine of fourth cheek tooth now twice as wide as enamel. 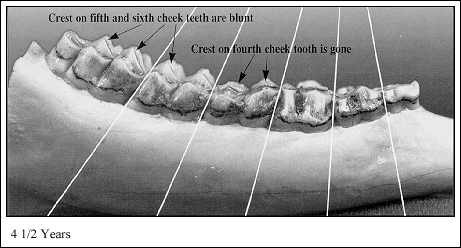 Dentine of fifth cheek tooth wider than enamel.